• Do you believe in “original sin”? Why? • What similarities do you see between the temptations of Jesus and your own temptations? • Do you find elements of both Adam and Christ in yourself? What are they? The Scripture readings for the Sundays of Lent are extraordinarily rich. The Old Testament texts provide a sketch of the history of our salvation. The Gospel readings focus on key episodes in Jesus life and ministry. The epistle readings emphasize what God has done for us in and through Jesus life, death and resurrection. Lent is a time for self-examination, repentance and acts of self-control and self-denial whether we are are preparing for baptism, confirmation and Eucharist or are already full members of the Catholic Church. The danger is that we can make ourselves the focus of Lent. Lent is pre-eminently a time for entering into the suffering and death of Jesus. The Sunday readings can help us to place our observances and even the passion of Christ into the larger context of the history of our salvation. That history begins with Adam and Eve. 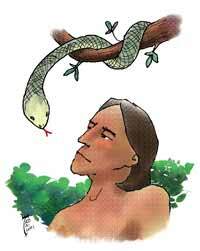 Todays selections from Genesis 2 and 3 tell the story of the original sin. The first part tells how God created Adam (meaning the human) and placed him in the garden of Eden (meaning delight). The one commandment imposed on Adam was the prohibition against eating from the fruit of the tree of the knowledge of good and bad. The second part tells how Adam and Eve were tempted by the serpent, who promised that if they transgressed that command, they would not die, but instead would become like gods. They succumbed to the temptation and committed the original sin. Their sin has consequences for us all, and the story helps to explain what is wrong with us and why humans often do terrible things. It has been said that original sin is the easiest theological doctrine to believe. The human condition is not entirely hopeless, of course. We are no longer forced or doomed to repeat the pattern set by Adam and Eve. On our own, by human effort alone, we could not break that pattern. Rather, we need the example and the power of Jesus the Son of God. The example of Jesus the Son of God is illustrated in Matthews version of the temptation of Jesus. At three points Jesus rejects Satan's temptations to make him stray from his vocation as the new Adam and the new Israel. By his repeated appeals to Israels Scriptures, Jesus resists Satan's temptations to satisfy his physical hunger, to make a public show of his powers and to grasp at political power. Instead, Jesus retains his focus on serving God alone and shows us how to resist temptations in our own lives. Whereas Adam and Eve failed in their test, Jesus emerges as the victor over sin and Satan and shows what kind of Son of God he really is. We can hope to imitate his example. And through Christ we have the power to do so. Todays reading from Romans 5 shows why that hope is possible and even realistic. It is because Jesus as the new Adam has broken the reign of sin and death, and because through his obedience, shown in his sacrificial death, Christ has reversed the consequences of Adams sin and made it possible for us to enjoy right relationship with God. According to Paul, Adam and Christ represent two aspects or dimensions of the human condition. Paul wants to emphasize that the gift (which is Christ) is not like the transgression (which is Adam and his sin). The gift has come to us through Jesus life, death and resurrection. The result of Jesus fidelity is that the reign of Gods grace and eternal life is open to all of humankind. Whereas Adam was disobedient to Gods command, Christ was obedient to his Fathers will even to the point of death on the cross. Whereas Adam sinned, Christ remained righteous and without sin. Whereas Adam brought condemnation on himself and his descendants, Christ brought acquittal from judgment and the possibility of right relationship with God (justification). And whereas Adam brought death upon us all, Christ brings to us all the possibility of eternal life with God. The first Adam brought disobedience, sin, condemnation and death. The new Adam has brought obedience, righteousness, justification and eternal life. Through the first Adam we became wounded and weak. Through Christ we are now Gods children more than ever and so people of hope. We can now legitimately hope for and realize what Adam and Eve thought they could obtain by succumbing to the serpents temptation. We can become like gods through the example and the power of Jesus the Son of God. And we can hope for eternal life with God in the fullness of Gods kingdom (You certainly will not die). This article also appeared in print, under the headline "The First and Second Adam," in the February 4, 2008 issue.